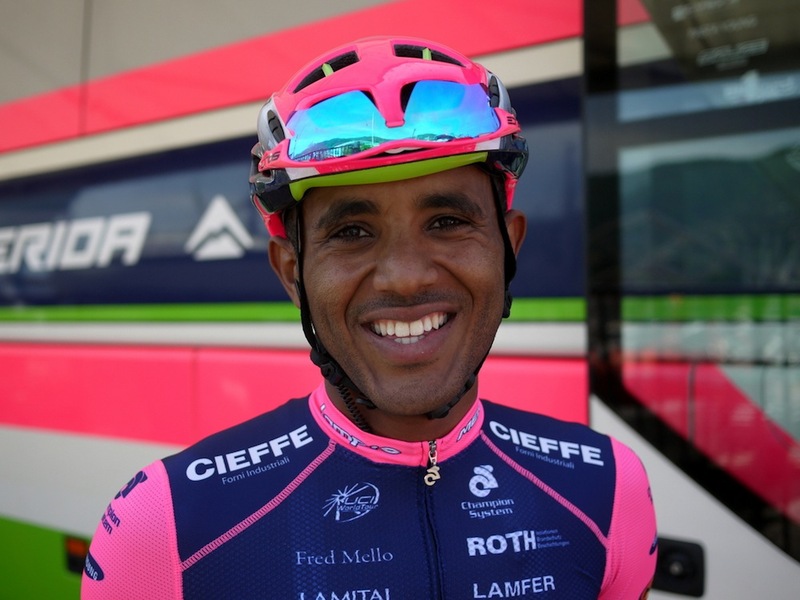 Tsgabu Grmay’s road to become the first Ethiopian in the Giro d’Italia was not easy. Dirt roads, sharing a room with four sisters and breaking the African/European barrier might have been harder than riding the first three stages of this year’s Giro d’Italia. Grmay made had his break riding with the UCI centre in Switzerland. It was his launch pad for spots in Pro Continental team MTN-Qhubeka and now WorldTour team Lampre-Merida. “Ethiopia’s eyes are on me,” Grmay told Cycling Weekly. Grmay grew up near Mek’ele, a city that sits at 2400 metres. His family, he said, is a “sporting family” with cyclists, his dad and his brother rode bikes and gave Grmay his first bike. “We had local races. My dad and brother rode those, but never made it this far, though,” Grmay added. Lampre sends Grmay back to Ethiopia as much as possible from the Milan or Rome airport so that he feels at home and because it sits on a plain at altitude. He may be short of paved roads, but is able to ride up to 2800 or 3000 metres. “My fist time in Europe in 2011, everything was hard,” Grmay said. Training and the support of South African team MTN and the UCI helped Grmay make the next step. Lampre took him to Tirreno-Adriatico, Volta a Catalunya and the Tour de Romandie stage races this spring. Former world champion and teammate Rui Costa was so impressed with the way Grmay climbed and helped the team, that he asked team manager Brent Copeland to bring him to the Tour de France. “We wanted to,” South African Brent Copeland said. “I see him more as a Tour de France rider than a Giro rider, the way he climbs, the results he has. I saw him going in Catalunya and Romandie, those climbs suit him better. Grmay is a first in Grand Tour history. Just like China had its first rider, Cheng Ji, in the 2013 Giro in Naples and in the 2014 Tour de France, Grmay made history for Ethiopia when he set off from San Lorenzo al Mare on Saturday’s stage one. “The Giro is already a dream come true, it’s a big step,” Grmay continued. Being in a team is nothing new for him, he has been in one all of his life. Having four brothers and five sisters – sharing a bed and room with four of them – conditioned him for life on the road in a Grand Tour cycling team.